Tower Hamlets is a local community of twenty neighbouring Church of England parish churches and congregations in east London. The Deanery is synonymous with the London borough of Tower Hamlets and is bordered in the south by the river Thames. Our northern boundary is formed by the London borough of Hackney. At the western end of the deanery the parish of Christ Church Spitalfields runs up to and just into the City of London. In the east we are now famously bordered by the Queen Elizabeth II Olympic park. The canary Wharf estate sits to the south of the deanery. We believe Tower Hamlets is a great place to live and to worship God. Each parish maintains its own website. Tower Hamlets Deanery website is www.thcofe.org. Image: The City and Tower Hamlets by Michael Garnett, used under Creative Commons licence. The Revd Peter McGeary --- Major Incident Team Co-Ord. The Bishop of London lead a confirmation service at St Anne’s Church, in Hoxton, on Sunday 13 January. The reopening of St Luke’s Millwall, right in the heart of the Docklands to serve the expanding community. Bishop Sarah Mullally visited a new community land trust won by St George in the East, the Centre for Theology and Community and the Darul Ummah mosque. A new church, St Luke’s Millwall compete with a spire has joined the East London skyline in Tower Hamlets. Alley Nichols, children’s worker at Christ Church Spitalfields, describes the impact of a Prayer Space at her local primary school. 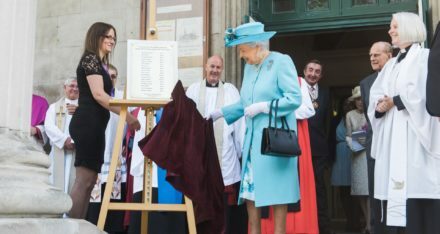 All Saints Poplar recently hosted the Queen and the Duke of Edinburgh at an anniversary service to remember pupils killed in the bombing of a school by the German Airforce during the First World War. Muslim, Christian and Jewish leaders walked together from St Paul’s Cathedral to East London Mosque to recognise what people of faith do for others. Palm Sunday processions took place around the Diocese last Sunday. The Telegraph and Church of England blog looked at some of them, including the revived tradition at St Peter’s Bethnal Green. The Bishop of Stepney led a vigil at St John on Bethnal Green last night for the victims of the Westminster attack, sharing the message that hate will not divide the people of Tower Hamlets. The aim of the weekend is to help those who have maybe never been on retreat before to gently enter the world of silent retreats. Silence is where people have sought and found God – this day led by Richard Carter will provide a ‘beginner’s guide’ to silence.